What’s My Light Level Mod is for you if you like to get technical in Minecraft, if you have ever built a farm in Minecraft or a mobs spawner I guarantee you will think this Mod is usefull, and you may possibly download it for next time you make a mob spawner. What’s My Light Level Mod for Minecraft 1.4.5. Its in the name, the Mod helps you out with your light level. The What’s My Light Level Mod is up to date with Minecraft 1.4.5 and works with the latest weekly snap shot. 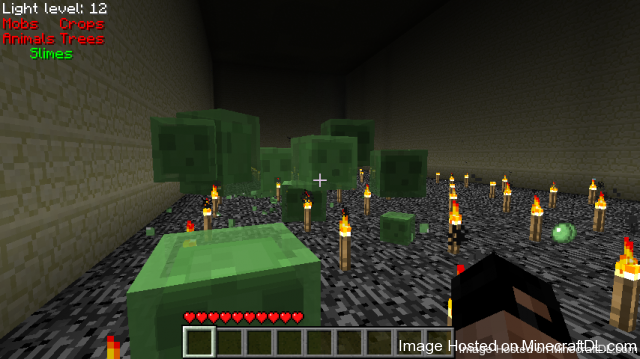 When you place a torch or any light source it will give of light, that light only lasts for so many blocks, in mob spawners mobs can only spawn in a low light level. So What’s My Light Level Mod will allow you to check your light level and make an effective spawner. The light level is simply displayed in the top corner and as you walk about your light level will change, so the number will change. Check out the clip by our YouTube Partner!